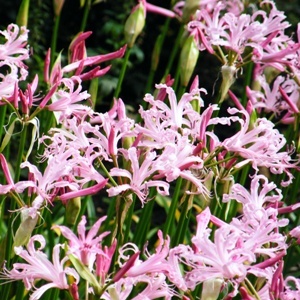 Named after a water nymph of Greek legend, Nerine, and bowdenii after Athelstan Boden-Cornish, who is credited with introducing the plant into British garden in 1902. Nerine gives a spectacular floral display of pink, lily-like blooms with recurved petals in autumn, which can be seen on the terrace and in a swathe of pink on Paxton’s Prospect. The flowers are produced after the leaves have died back which gives the unusual architectural look of the stems coming erect from the ground. Found in mountain screes of South Africa, in Europe they benefit from being at the base of a south facing wall, in fertile free draining compost, keeping the bulbs warm and dry in summer while dormant. Bulbs are fully hardy, but early frost can kill off flowers. This is a great plant for prolonged floral interest in the autumn. It is also spectacular in a greenhouse, conservatory where frosts will not bring the floral display to a halt and can produce cut flowers through to Christmas.